Combine brown sugar, pumpkin, the egg and egg whites, and the oil in a large bowl and mix until blended (medium speed if using electric mixer). Add flour, baking powder, cocoa powder, cinnamon, allspice, salt, and nutmeg. Beat until smooth (on low if using electric mixer). Stir in the chocolate pieces. Spray an 11x7x1-1/2-inch baking pan with nonstick coating. Pour the batter into it and spread it, then bake it at 350º F for 15 to 20 minutes or until a toothpick comes out clean. 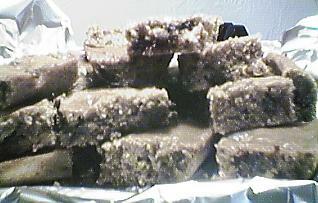 Cool in pan, then cut into 15 squares.